How does the CliniMACS Prodigy work? Integrated sampling pouches are removed by disconnection through sterile welding to maintain the closed system. Using the CliniMACS Prodigy, cell enrichment or depletion, centrifugation, and cultivation are performed on one device using a single-use tubing set composed of bags, fluidic paths, centrifugation chamber, columns, and temperature control element. 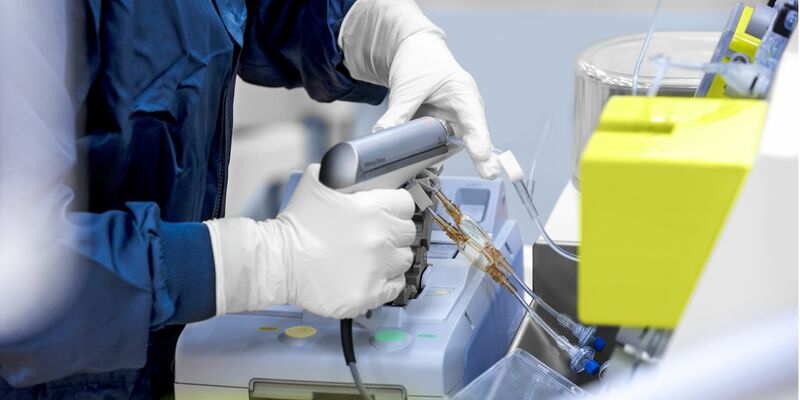 Options for aseptic connection are provided to protect your sample from setup to final product removal. 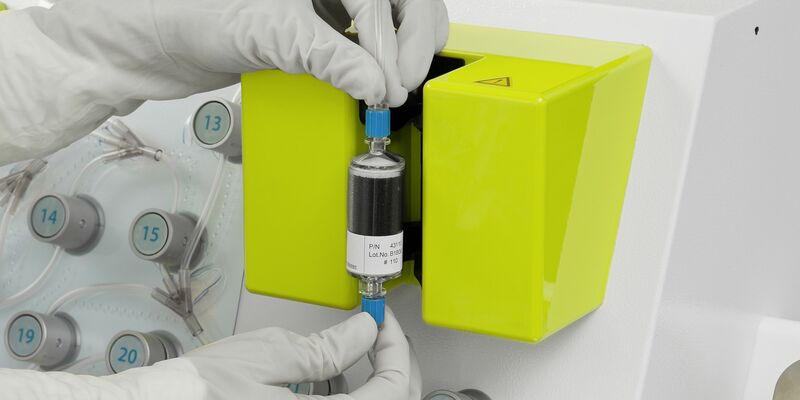 Integrated IPC/QC sampling pouches allow the option to take a sample without opening the system by disconnection through sterile welding. The CliniMACS Separation Column provides integrated cell enrichment or depletion by surface markers. High variability of samples within the autologous setting is a recognized, industry-wide challenge. The CliniMACS Prodigy provides integrated cell enrichment or depletion by surface markers. For complex procedures, like manufacturing of CAR T cells, a robust and standardized process should start with a well-defined cell population. Cell subsets are easily enriched using clinical-scale separation as a closed, integrated step in your manufacturing procedure. 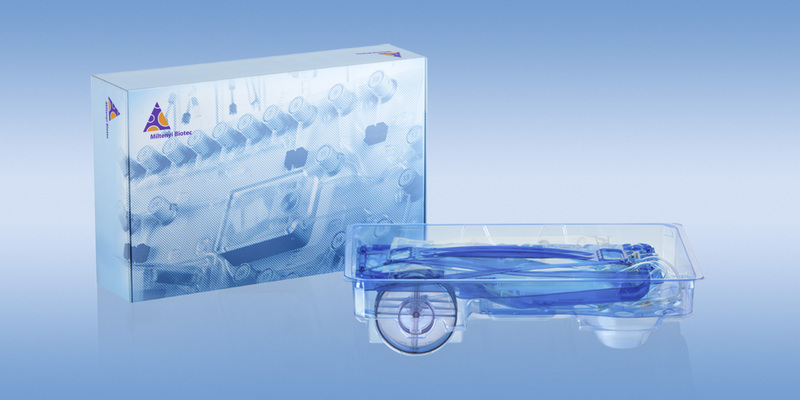 A variety of manufacturing processes come pre-installed with the CliniMACS Prodigy, including automated generation of CAR T cells, antigen-loading of dendritic cells, virus-specific T cells, and more. Additionally, common culture and sample preparation procedures, such as concentration and density gradient centrifugation are also provided. With the CliniMACS Prodigy, you can also adjust individual steps to fit your process. Cultivation parameters can be easily configured and scheduled with the Activity Matrix, integrated into many pre-installed processes. The CliniMACS Prodigy Tubing sets are a key component of the CliniMACS Prodigy System. They enable sample preparation, separation, genetic modification, and cultivation of cells from a variety of sample sources for bioprocessing. The tubing sets are biocompatible and disposable. They provide a closed and sterile fluid path and the functional components for cell processing, which include: system tubes and appropriate connectors, sterile filters, centrifugation/cultiviation chamber, bags, and quality control sampling components. Certain tubing sets contain a separation column and/or heat exchange cartridge. Within the CliniMACS Prodigy Cell & Gene Therapy Manufacturing System we provide regulatory support regarding our products. The tubing sets are single-use, biocompatible, and disposable. They provides a closed and sterile fluid path and the functional components for cell processing which include: system tubes and appropriate connectors, sterile filters, centrifugation/cultiviation chamber, bags, quality control sampling components.